There has been a sea-change in the focus of organisations, private or public away from a traditional product- or service-centricity towards customer-centricity. Projects are just as much a part of that change. 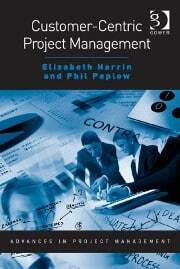 Projects must deliver value; projects must involve stakeholders, and Elizabeth Harrin and Phil Peplow demonstrate convincingly that stakeholders are the ones who get to decide what ‘value’ actually means. Customer-Centric Project Management is a short guide explaining what customer-centricity means for how you work and its importance for project performance. Using tools and processes to guide customer-centric thinking they will help you see the results of engagement and demonstrate how things can improve, even on difficult projects. The book is a straightforward implementation guide to moving your own business to a customer-centric way of working, using a model called Exceed. It provides structure and guidance for ensuring that customer-centricity is sustainable and supported in the organisation. It’s a highly practical but rigorous and well-researched text. It draws on established models and uses the example of project implementation in a healthcare environment to demonstrate the impact of this significant way of thinking about value. Adopting a customer-centric mindset and using the Exceed process to measure and monitor customer satisfaction will help you move towards working with happier, more engaged stakeholders.